New Hampshire's majestic White Mountains offers so many wonderful sights, including rugged mountain peaks poking through sun-streaked clouds, the spectacular National Forest along the Kancamagus Highway, and the breathtaking natural chasm that is the Flume Gorge. Then, there are the red and green Dodgem cars plowing into each other at Santa's Village. Too blasé to marvel at the area's natural wonders, kids prefer man-made attractions such as New Hampshire's theme parks. For decades, Santa's Village has been a whimsical, yet vital part of the region's warm-weather vacation offerings. While not as old as the Flume, time appears to have almost stood still at the park. For wistful baby boomers, it is as if their grainy home movies or black and white Brownie photos come to life when they revisit the place with their own grandchildren. In fact, one of the biggest fans of Santa's Village is baby boomer and legendary professional wrestler, Mick Foley. In an era when Six Flags and Disney feature hyperactive roller coasters and multi-million dollar high-tech rides, the White Mountain park has retained its down-home charm and gentle appeal. That's not to say that its attractions have not evolved or that the park hasn't introduced some innovative new rides and shows. But Santa's Village does take pride in the sweet nostalgia it offers. "We're still like old New Hampshire," asserts the family-owned park's Elaine Gainer, a second-generation operator. "We call ourselves a New England family tradition." Legend has it that Gainer and her dad, Normand Dubois, were driving along Route 2 in Jefferson, New Hampshire when a deer jumped in front of their car. Narrowly missing the animal, three-year-old Elaine asked her father if that was one of Santa's reindeer. 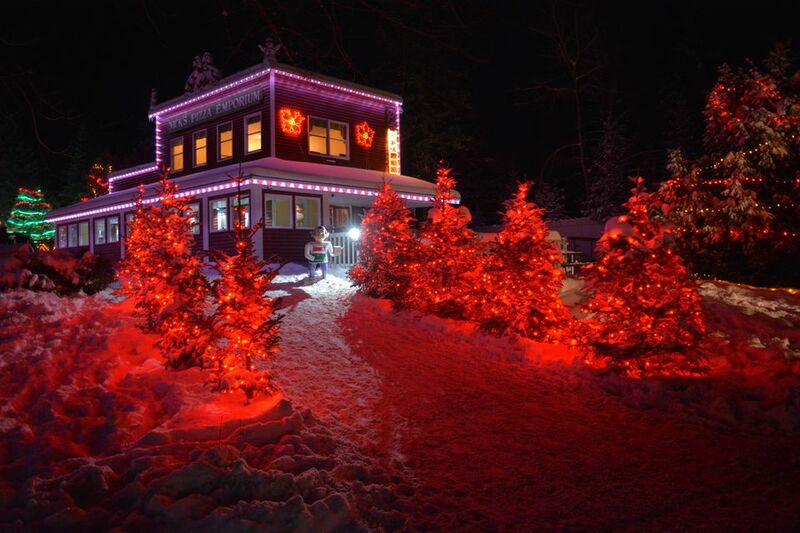 Like an epiphany, Dubois, seeking a career change, purchased the land and opened Santa's Village in 1952. Decades later, young families still delight in the Christmas-themed park. Kids of all ages love Rudy's Rapid Transit, a not-too-fast, but not-too-wimpy, roller coaster with the red-nosed reindeer leading the train of cars. Other rides include a thrilling "Yule" log flume, a train ride with a certain jolly red-suited gent serving as the engineer, and a carousel with flying reindeer instead of horses. One of the most popular and unique attractions at Santa's Village is Santa's Skyway Sleigh. Individual monorail cars, designed as adorable sleighs, wind their way along a track throughout the park. Presentations include a 3-D Christmas-themed film and live magic shows at the park's Polar Players Theater. The climate-controlled facility also features an animatronic Christmas show and Santa's Clauset, a dizzying maze that can keep kids comfortably occupied on rainy or sweltering days. Santa's Village doesn't have a full-fledged water park, but it does offer some water slides and other attractions (so be sure to bring your bathing suit). Water park features include the Ho Ho H2O interactive water play structure with a tipping bucket, Poogee’s Splash Pad for young children and the Joy Ride Slides. Admission as well as prices inside the park for food and gifts are quite moderate. "We offer really good value," says Gainer. "While we give senior discounts, we recognize that young families, our core audience, need to be treated special also." One of the hallmarks of Santa's Village is its hands-on interaction. "Rides are nice but they're passive," says Gainer. "We want to get kids involved." The Polar Theater complex includes Santa's Workshop. Here, kids become Santa's helpers. They can decorate their own ornaments or personalize keepsake T-shirts. At the park's bakery, children can add the icing and other goodies to gingerbread men. And kids can be seen punching their "Elfabet" cards at elf-stamping machines hidden throughout the park. Children who collect all 26 letters win a prize. The ultimate interactive experience at Santa's Village, however, is a personal audience with jolly old St. Nick. Holding court at his summer residence, children can get an advance request in to the man who is making a list and checking it twice. Is the smartphone generation too cool to enjoy a park that seems stuck in the 1950s and pays homage to St. Nick? "The myth dies hard," says Gainer. Indeed, with Bing Crosby perpetually crooning "White Christmas" amid the Currier and Ives setting, the park oozes nostalgia and speaks to the child in all of us. Today's sophisticated kids aren't too jaded; they are too busy having a ball and tucking away their own Santa's Village memories. The park is located in Jefferson, NH (in the White Mountains region). The address is 528 Presidential Highway, also known as NH Route 2. The park offers a discount for visitors 62 and older. Children 3 and younger are admitted free. Guests arriving 3 hours or less before closing receive a complimentary pass to visit for another full day. Two-day passes and season passes are available. Passes can be purchased online at the official site of Santa's Village. Admission includes complimentary parking, complimentary stroller rentals, and complimentary pet kennel services. Santa's Village is open starting in late May through late October. In the fall, the park offers Silly, Spooky Halloween. Although it can get quite cold in the late fall, Santa's Village is open on select days for its Christmastime event and New Year's Eve Partybration.